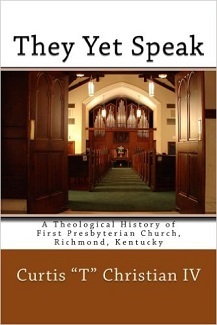 The Second Edition of They Yet Speak: A Theological History of First Presbyterian Church, Richmond, Kentucky is now available at Amazon.com. First Editions are Still Available!! 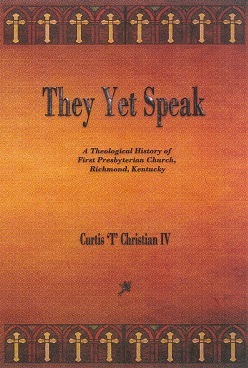 First Presbyterian Church now has in stock some copies of They Yet Speak: A Theological History of First Presbyterian Church, Richmond, Kentucky. This is a 471-page hardcover book, which sells for $30. If you would like to purchase a copy, please contact the church office [e-mail: dmillerfpc@bellsouth.net; or telephone: (859) 623-5323, ext. 0]. Today’s historians endeavor to write history objectively, dispassionately, and impartially—striving to purge their historical narratives of any and all bias. Their historical narratives are written in such a way that persons of all backgrounds should be able to see and acknowledge the same tangible events of bygone days. In recounting the history of First Presbyterian Church of Richmond, Kentucky, historians might tell the church’s story dispassionately. But, then they would also tell its story without purpose and devoid of meaning. But when the congregants of First Presbyterian recount the church’s history, they are telling a story about God—a story of God’s justice and grace, of love and compassion, of redemption and hope. They Yet Speak: A Theological History of First Presbyterian Church, Richmond, Kentucky gives voice to our story so that we may continue to make Christ’s love known to the City of Richmond, the County of Madison, the Commonwealth of Kentucky, and even the entire world. If you would like to read an article from the Richmond Register (August 9, 2014; Volume 123, Issue 190; Page A-2) about They Yet Speak, click here. Copies of They Yet Speak are now available in libraries across the country. 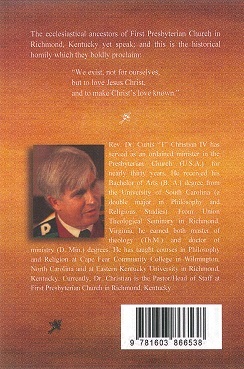 If you would like to check out a copy, click here to find a library near you.